"Nature's grocery store right outside your door"
Your foremost source for Design, Installation and Maintenance of Organic Herb and Vegetable Gardens, Kitchen Gardens, Edible, Native and General landscaping. We also specialize in care and maintenance of fruit trees and orchards. We will design, install and maintain your garden "Nature's Way"; without the use of chemically based fertilizers, pesticides, and weed control. Scientific research has found these chemicals to be toxic to humans, animals and microscopic life in the soil, as well as, ground water and the vegetables we consume. Organic growing is "Nature's Way". The benefits of an Organic Home Garden are, less travel time to table, health benefits, better taste, and greater nutrition. What we call organic today, our Grandparents simply called food. Installation services include an onsite consultation to discuss with you the plan for the placement, soil condition, building requirements and time line for the proposed organic vegetable garden, or edible, native or general landscape. Our team of expert gardeners will install the following of your choosing: raised beds, inground beds, pots (cement, terracotta, fiberglass, glazed), irrigation, garden structures, and garden art. 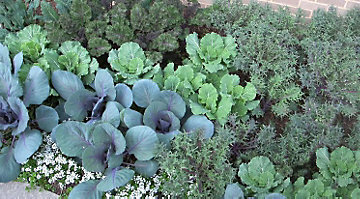 We will provide you with a list of season appropriate plants, vegetables and herbs for you to choose from. We also recommend regional appropriate fruit and citrus trees per your preference. Our design system allows for the appropiate balance of aestheic and plant yeild. We match our layout, design and placement upon the current topography and feel from you the client. We incorporate balance, permaculture, and use of convience into our designs. 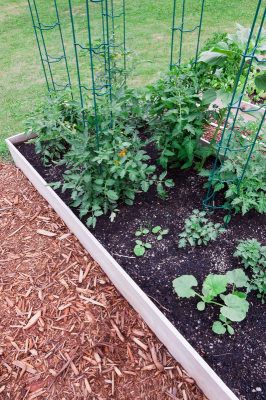 Just as one relies on a regular gardener for their lawn and landscaping needs, a vegetable gardener is also needed for your vegetables. Whether it's a garden we just installed or an existing garden, maintenance is a MUST. We have found that the clients who chose the maintenance options have healthier plants and bigger harvests. 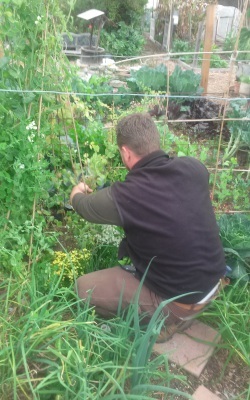 Vegetables, fruit trees, edible landcscapes and native/succulent landscapes need upkeep, care, feeding, pruning, soil enrichment, insect control and cleaning. We offer multiple maintenance options per your site specific landscape, ranging from weekly to Bi-Yearly. Contact us today to make suitable arrangements. Have a busy lifestyle? Not retired with lots of time on your hands? Not physically able? You can still have fresh organic produce from your backyard, choose one of our maintenance options and we will do the work for you. 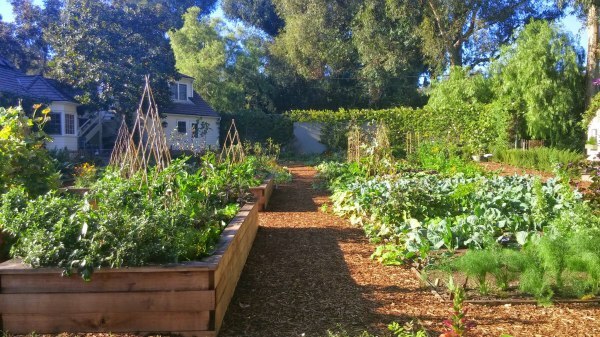 Vegetable Gardens in Los Angeles and surrounding areas have two growing seasons. The Warm-Weather season, which is the longest, roughly ranging from March to October. This season includes Tomatoes, Cucumbers, Squash and most Beans. The other is the Cool-Weather season, which includes Cabbage, Cauliflower and Broccoli just to name a few. Instead of Oaks, Pine Trees, Green Shrubs and Grasses, let us help you pick trees, shrubs and plants that will have a dual purpose. Not only will it be aesthetically beautiful but also edible. Studies have shown that "fresh" picked herbs, vegetables, and fruit have more nutritional value and have more robust flavor than those bought in the store. "Natives are adapted to our seasons," says Kitty Connolly, executive director of the Sun Valley-based Theodore Payne Foundation, a nonprofit dedicated to California native plants. "Now is the perfect time to plant so that you will have a beautiful garden next spring. Most of these plants are dormant in the summer, but they take advantage of cool weather to grow." In many urban cities, the majority of people live in apartments or houses that have minimal sized yards. 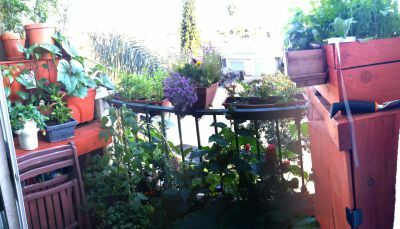 Since Los Angeles has few community gardens let us show you how you can configure your balcony and/or patio into a green sustainable edible "Eden" that you can enjoy and produce your favorite herbs, vegetable and fruits. Custom made from redwood or cedar to fit the contour and landscape of your property. 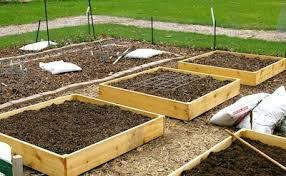 Don't have room for garden beds??? 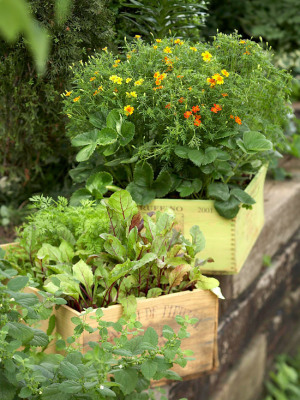 Enjoy growing your own herbs and veggies from planter boxes, pots and hanging baskets. Ready to get rid of your lawn and start mini-Farming your property!!! Made from redwood, cedar, stone, brick or re-purposed material. 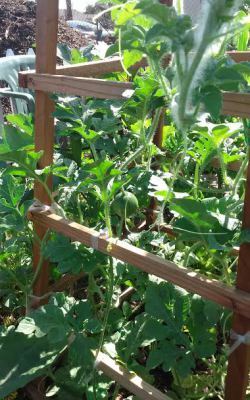 Wooden Oblisks, TP's, Tomato cages, Wire caging, Stepping Stones, Vertical Gardening Structures, the options are endless. ​ You can now enjoy healthy, delicious, nutrition packed organic vegetables grown fresh from your garden. With the soaring cost of organic produce in the supermarket it makes practical since for you and your family, to grow your own. Experts have long-believed that children who grow, prepare and eat their own food make healthier food choices. Researchers have found that children are five times more likely to eat salad and other vegetables, when they have grown it themselves. 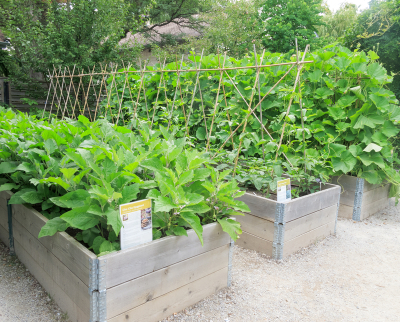 You can now grow enough organic veggies for family and friends. While California is currently experiencing a drought, many homeowners have opted to install drought tolerant landscapes to conserve water. The state of California offers rebates to homeowners who change their grass landscapes to native California plants, that naturally require less water and makes for a beautiful surrounding, that attracts native birds, butterflies and honey bees. 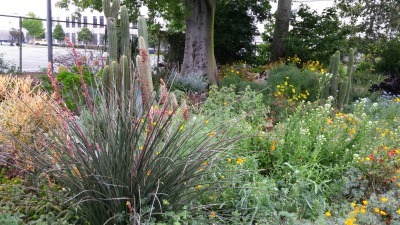 Saves Water: Once established, many native plants need little irrigation beyond normal rainfall. Low Maintenance: Native plants require less pruning, fertilizer, water, and less time to maintain. Less Pesticide: Native plants have developed their own defenses against many pests and diseases. Most pesticides kill helpful creatures that control pest populations. Beneficial insects, such as ladybird beetles (ladybugs), praying mantises, and lacewings prey on pests, such as aphids, scale and spider mites. By eliminating pesticides, pest control occurs naturally, which prevents pesticide-polluted runoff from flowing to waterways. Gardening with natives creates wildlife habitat. Native plants and animals were “made for each other”. With the changing weather patterns, raising costs of produce, the continual use of GMOs and powerful chemically derived pesticides the future can look a little dreary. Take this opportunity, with the city rebates to create your own garden of Eden on your property. 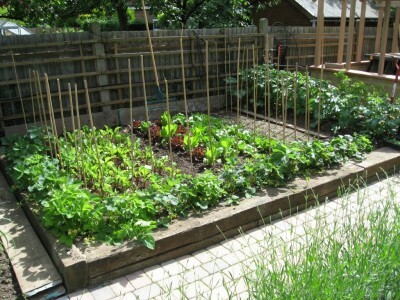 Enjoy the fun, taste and nutrition of growing your own produce. Organic Harvest Gardens can show you how.